Are you as chocolate obsessed as the acomos office? This Easter we are giving you the chance to win a cracking prize for all the family! One lucky winner will win a family ticket (two adults, two children) to the ultimate chocolate haven, Cadbury World in Birmingham. Cadbury World is a visitor attraction, featuring a self-guided exhibition tour, created and run by the Cadbury chocolate company. A take a stroll down Bull Street, make your very own chocolate treats and experience the 4D chocolate adventure. To be in with the chance of winning this fantastic family prize, simply follow us on Twitter and retweet our competition post. You can also gain one extra entry by signing up to our email newsletter. Competition closes on Sunday 21st April 2019 at 12pm. Winner will be picked at random and informed via email or social media. 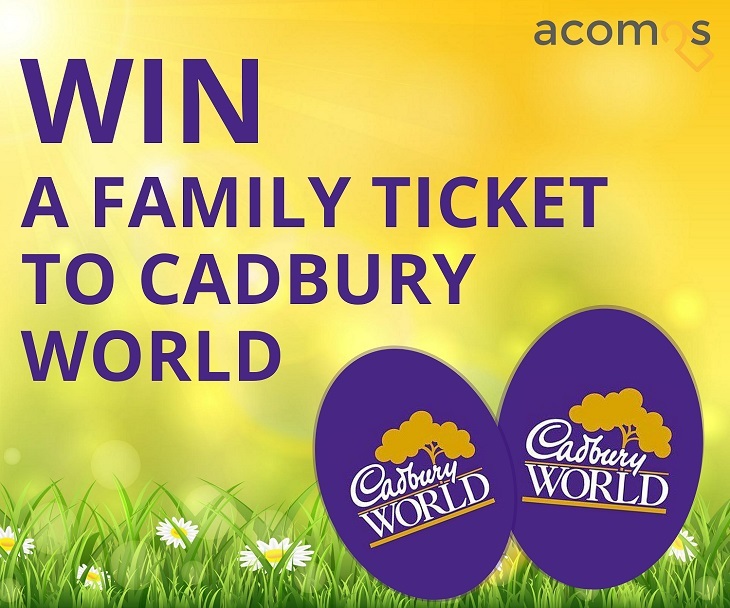 Prize is gift voucher for two adult tickets and two child tickets to Cadbury World, Birmingham. Travel not included. The prize is non-transferable and cannot be exchanged for cash or an alternative prize or combined with any other offer, promotions or discount.